The Oneplus 6 is now on the market and after a quick handling of the phone here’s what we think about it. 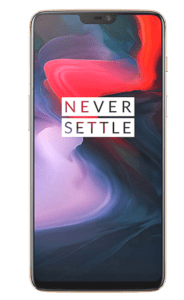 What makes this phone special and different from every other phone that Oneplus has ever made? The big things are the materials they use. Well, for the past 2 years Oneplus has been making phones with aluminum material. They would have aluminum backs and they looked like a very premium phone, but very generic looking, almost boring. 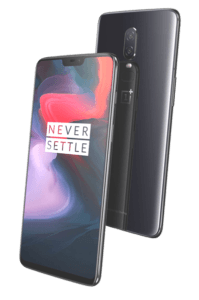 This year, the Oneplus 6 has been made with the Gorilla Glass 5 front and back with three variants. There is a Mirror Black, Midnight Black, and a Silk White. The Mirror Black is actually designed to look like a ceramic material, but without the weight. So, glass-backed phones, like the iPhone X and Samsung S9, have a very obvious kind of glass surface to the back of them. It looks good, and you’ve seen it a 1000 times. Ceramic phones have a distinctly different look to the material. It still has a glossy finish, but there’s a certain way that the light reflects on ceramic phones, and the Mirror Black finish on the Oneplus 6 has just that. They accomplished this by putting a film under the Gorilla Glass 5 and it gives it a distinctly different looking reflection. The end result is that it looks really unique in person. Midnight Black is the second option on the Oneplus 6 and it uses this acid etched glass. Basically, they’re using a corrosion process on the Gorilla Glass 5 to give it a fantastic texture. It has a smooth satin finish to the glass and very similar to the glass trackpads of the MacBook Pro. It really has a silky smooth finish to it and hides fingerprints better than your average glass or aluminum finish. If you just look at it it doesn’t look different aesthetically, but when you touch it, it feels phenomenal. The Mirror Black stands out more but the tactile differences between the two are crazy. The third color option is a Silk White. It is a white colored back with a rose gold finish for the metal frame. The white material has a pearlescent look to the finish, I really dig it actually. However, it’s a limited edition and not available yet. One thing that’s kind of a brain teaser is the fact that it has this glass back enclosure; however, for some odd reason, the Oneplus doesn’t support wireless charging. Now, this is significant because phones that are full glass like this have wireless charging. That’s the point in having a glass back because it allows for a better wireless charge. The drawback to a glass back is that the phone itself becomes much more fragile and susceptible to cataclysmic drops. So, aside from just looking a bit cooler, there’s no reason for the glass back in any type of functional scenario. Getting to the screen; it has a notch. I don’t feel as bothered by this notch as I do from other phones. For one, Oneplus was showing pictures of this notch for a while, so, maybe I was expecting it. The best reason for this notch though is that it really seems to keep the top and bottom bezels really thin. Consequently, they are actually using a ton of their screen’s real estate. Fortunately, if the notch is not for you there is a setting to hide it. Since it’s an AMOLED panel, it does a really good job of it hiding it. It’s still a 1080p panel, and it’s a very nice-looking display. It’s a large display measuring in at 6.82-inches and noticeably bigger than the Oneplus 5t screen. The cool thing is the device itself is essentially the same size. The camera has obviously been updated. This year they brought back the optical image stabilization. This was something that was missing from the 5t because OIS helps with everything, especially for low-light photos. Lastly, is the software. This little guy here ships with Android 8.1 and it has their Oxygen OS on it. It carries over many of the gestures that we saw with the 5t software. Navigation is really easy to get used to. You swipe up to go home, and then the back buttons are triggered with sliding up from the side. It sounds weird, but it’s really easy to get used to. The idea here, like the notch, is to maximize your screen’s usable area. All of the other classic Oneplus goodness is still here. You get the fastest Snapdragon 845 processor. It’s going to be faster and more energy efficient. You get dash charging and that gives you a full day’s worth in a 30-minute charge. You get the super fast face unlock. One of my personal favorites that I feel every phone should have these days is the dual SIM card option. This phone has that too. Also, you have the Oneplus alert slider, which is a little bit different this year. It’s on the right side, so if you’re a Oneplus veteran it might take a little bit to get used to since up until this year, it’s always been on the left-hand side. Most of us are right-handed, to me, this makes a lot more sense since that’s where our thumbs are. You also still get a headphone jack. Oneplus, at this point in their game, doesn’t seem to be ditching that yet. I wasn’t expecting them too, and it’s nice to see that they didn’t. Pricing on this device starts at $530.00. That’s for the base model with 6GB of RAM and 64GB of storage. For the 8GB of RAM and 128GB it’s $50 more and for 256GB of storage, it’s another $50 increase. The bottom end pricing seems a bit high to me. it doesn’t look as if Oneplus is playing in that budget price-point anymore. This puts the phone in a mid-tier league. They also announced Bullets Wireless headphones and they are everything you want in a set of cheap Bluetooth earbuds. They are charged by USB-C and that’s difficult to find. Years ago when Oneplus first launched they had a $300 smartphone that was really inexpensive that a lot of people liked. Over the years prices have gone up. I think one of the complaints that a lot of people had is that it is no longer a budget phone. They have always had high-end specs with really good performance. If you want a phone in the $500 price range that performs and looks like a flagship phone, then you should take a look at this newbie. Huawei P20 Pro - Best Camera Ever?